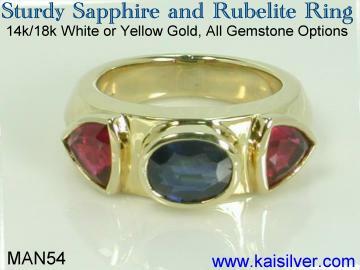 Many of you might not be aware that, both sapphire and ruby come from the same mineral - corundum. 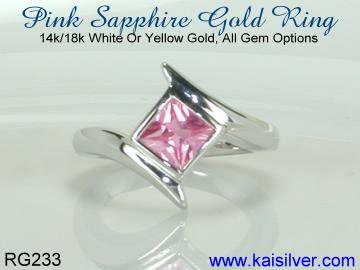 Since Kaisilver sapphire rings are custom made with the design and gemstone of your choice, there really is no limitation on the type of sapphire gemstone ring that you can order from us. Since science has now proved that sapphires are found in a wide color range, the idea that a sapphire ring would always have a blue sapphire gem is not very correct. Good workmanship and handpicked gems that deliver value at each price point are assured for both 925 silver and gold sapphire gemstone rings. While a good quality sapphire ring cannot be cheap, sapphire rings need not necessarily be too extravagantly priced. Sapphires are available in a range of prices and sizes, the price per carat of a sapphire will move up sharply as the gem size increases. This report refers to only natural sapphire gems and not factory produced imitations. At Kaisilver we procure these gems directly from the mines, we also have preferential access to the world's largest resources of cut and polished gemstones. 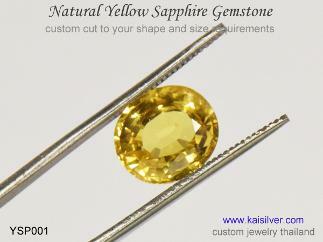 You can therefore request for the gem that you like, we can procure and custom cut the piece to suit your requirements. The design for your sapphire ring can be provided by you or, you could pick any item from our website and request for it to be crafted in gold or 925 silver with a sapphire gem of your choice. Get in touch with our experts at sales@kaisilver.com if you have any questions or requirements, related to gemstones and jewelry. Wear some refreshing glitter on your finger, a gorgeous pink sapphire and diamond sapphire ring. Available in white, yellow or rose gold and silver is also an option. You choose the sapphire colors that you wish to showcase in this ring, you could even mix different sapphire colors in the ring ... more. A classic design and skilled workmanship for this white gold sapphire and diamond ring. Shown with blue sapphires but can be ordered with white, blue, pink, yellow or white sapphires. This sapphire gemstone ring can be ordered in gold or sterlingsilver with a uniform or tapering band width ... more. Interesting design and quality workmanship are things that the modern man appreciates. 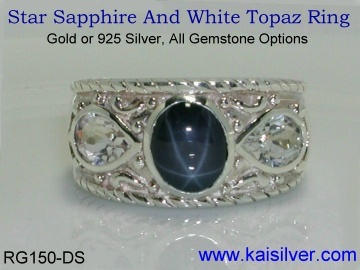 Here is a men's sapphire ring with side gemstones, a ring that will impress even the most discerning men. 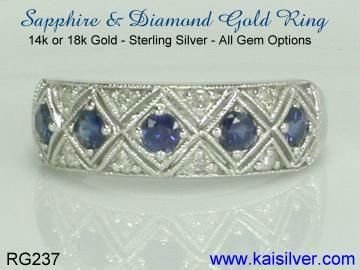 The silver or gold sapphire ring can have the side gems of your choice. The ring is designed and crafted to look great and last long ... more. Instantly add a touch of sophistication to your personality, slip this square sapphire gemstone ring on your finger. Choose a white, blue, pink, yellow, orange or green sapphire gem stone for your ring. Available in 14k or 18k gold or 925 sterling silver. We provide a choice of all three gold colors namely white, yellow and pink ... more. Pink sapphires selected by our experts and custom cut by very skilled gem artisans. Color hues from pink to purplish-pink, sizes range from 1.5 to 7 carats. Request for a custom made ring with your design or ours, let us source and cut the gem for you. 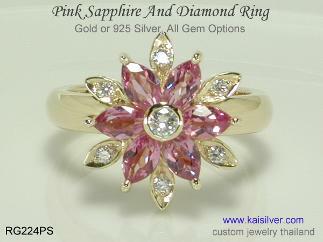 Kaisilver: We have been fulfilling requirements for high end custom made jewelry for over a decade. Widely accepted as the world's leading online custom made jewelry provider, we custom make all types of jewelry in gold or 925 silver jewelry. We will be glad to craft your jewels as per images provided by you. More than 7,000 quality conscious jewelry lovers spread across the 5 continents, today rely on Kai Silver for all their gems and jewelry requirements. Contact our experts at sales@kaisilver.com for any queries that you might have. A natural diffused star sapphire ring, the ring has a classic style and is shown with white topaz gems on either side of the star sapphire. Available as a gold or 925 silver ring with gems of your choice, you could also send in images of your own design to be custom made. An attractive price for a beautiful star sapphire ring ... more. A picture of true luxury and style, a 6mm cushion blue sapphire is flanked by a 3mm diamond on either side. Perfect for a sapphire engagement ring, priced to be within most budgets . 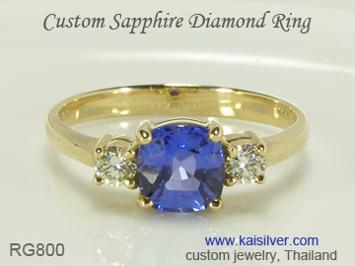 Order a silver or gold sapphire ring, custom made in all ring sizes. 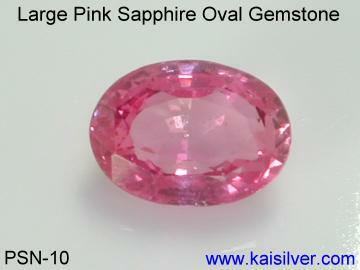 You could choose a pink or yellow sapphire instead of, blue ... more. For men who love to wear precious gemstone rings that make a clear statement, here is the king of style and function. A hefty sapphire and diamond ring, sturdy and durable. 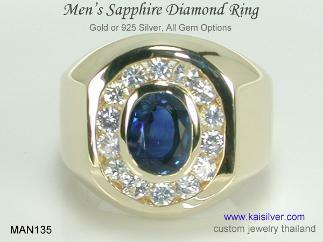 You could order this men's gold or silver sapphire ring with a yellow, white or green sapphire gem too. A range of gems to choose from ... more. From the bright sunny yellow to the orange-yellow hues of sunset, yellow sapphire gems have today established a loyal following. Yellow sapphire gemstone rings with oval, round and cushion cuts or more elaborate fancy shapes and dimensions.